Harris has a team that works so well together, to nominate one without the other would be like leaving jelly off of the peanut butter and jelly sandwich! Together, these two individuals truly represent the meaning of teamwork. Please join me in honoring Ben Sundine and Kayla Nickel as the co-recipients of the “We Are Harris” award for their ongoing dedication to our clients and products. 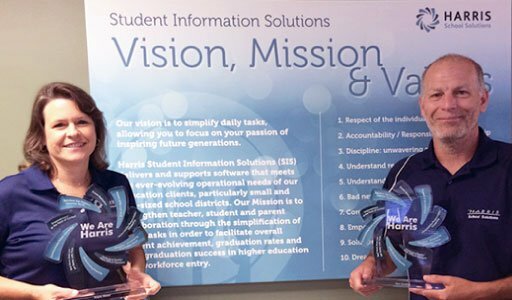 Together Ben and Kayla support 135 go.edustar clients within the Student Information Solutions business unit, based in Wichita, Kansas. Because of their superior product knowledge and the relationships they develop with their clients, their manager consistently receives heartfelt thanks for their dedicated work. Together they answer calls and emails, visit clients on-site, research state reporting requirements, help develop the product roadmap, and conduct webinar and onsite trainings. Ben has worked with Harris for eight years and spent the previous seven years supporting the go.edustar product line prior to acquisition; Kayla has been with Harris for seven years. Kayla finds that the core value Bad News Does Not Get Better with Time plays a big part in her day when delivering or receiving news that product support is needed. Ben also identifies with the core value of Respect of the Individual because he knows that the client’s time is valuable, as school personnel often wear many hats with few resources for support. Because of this shared perspective, their clients truly appreciate the support that Ben and Kayla offer – especially when they are faced with tasks that come around only once a year. They feel fortunate when they get to meet their clients on-site, which gives them a much better understanding of the day-to-day activities and environment. Please join me in applauding the outlook and enthusiasm of these two individuals! Our clients are as lucky as we are at Harris to have such a dedicated team to support and enhance our products. At Harris School Solutions we are thrilled to have some of the most knowledgeable and hardworking employees in the industry as part of our team! The “We Are Harris” Award is to celebrate, recognize and show our appreciation to an individual who exemplifies a particular Harris Core Value.